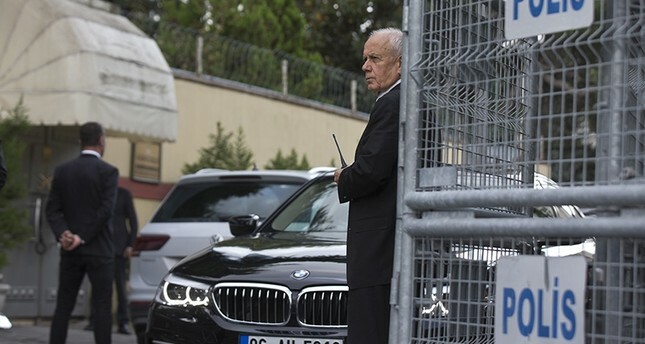 Interpol issued a red notice for the 20 Saudi suspects in the murder of dissident journalist Jamal Khashoggi upon Turkey's request, Turkish Justice Ministry officials said Thursday. The suspects, dubbed as the execution team who returned to Saudi Arabia after killing Khashoggi at the Saudi consulate in Istanbul on Oct. 2, 2018, will now be sought for arrest throughout the world. The Justice Ministry said it had requested red notices for 18 people on Nov. 15 and for two more on Dec. 21. The notice was issued on March 1 as part of Turkey's request over the investigation launched into the murder by the Istanbul Chief Public Prosecutor's Office. Turkish authorities accuse the suspects of arriving in Turkey for Khashoggi's murder, including a cover-up team also in charge of dismembering his body. Saudi Arabia on Thursday reiterated its rejection of calls for an international, independent investigation into the murder of Khashoggi, insisting it was well equipped to bring the perpetrators to justice. The head of a Saudi delegation speaking before the U.N. Human Rights Council in Geneva insisted that his country was taking all the "measures required for us to resolve this heinous crime." Bandar bin Mohammed Al Aiban, who heads Saudi Arabia's human rights commission, stressed though that any calls to "internationalize" the investigation "amount to an interference in our domestic affairs." Turkey's Presidential Communications Director Fahrettin Altun responded to Aiban's comments by demanding Saudi Arabia name the defendants on trial for murdering Khashoggi and disclose all the charges against them. "We urge Saudi Arabia to tell the world which individuals are currently on trial on what charge(s)," Altun said, to lay to rest any doubts that may arise about the "sincerity" of the judicial proceedings in the kingdom. Khashoggi was killed in the kingdom's Istanbul Consulate on Oct. 2, 2018, by a team of 15 people consisting of Saudi officials who arrived in Turkey for his murder and a cover-up team also in charge of dismembering Khashoggi's body.